When I arrived today at the Helsinki Olympic Stadium, I didn't expect to see a great five song acoustic set. 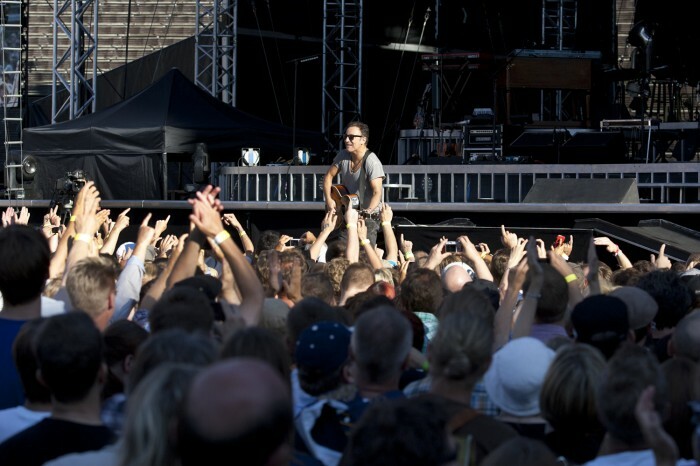 Although there was no scheduled soundcheck, Bruce came out on stage at 6:15 pm, shortly after arriving. I assumed he was going up to check out the stage, and at first he really was, but minutes later, I heard the speakers come on and Bruce began to riff and sing "I'll Work for Your Love." I realized that Bruce, coming to the venue after two days away from the stage, could not suppress his desire to connect with us from the microphone. It was clear as the set progressed through "Leap of Faith" and "No Surrender" that this wasn't Bruce warming up. He was hitting every note, and his voice was clarion clear. Closing out the set with "For You" and "Blinded by the Light," Bruce made it clear that there was something else he had come out to do. At the end of "Blinded," he climbed down to the audience, and he began a ten minute run of the barrier. Shaking a series of hands (and occasionally getting a peck on the cheek from young Helsinki women), he collected cardboard signs which would occupy his dressing room as he composed the set list. Each time he climbed the risers on his way to the left or right, completing a full lap of the stage, the crowd would erupt in a cheer, likewise when a young pink-haired fan gave him a hug, before he received her written request. Afterward he came back to the microphone to say, "Thanks to all you regulars and thanks for making it a lovely summer for us, and we'll see you in a little while!" Huge applause. So don't ever ask me what to expect at a Bruce concert, other than a great time and a great show, because there's no way to know.